Kart racing or karting is a type of open-wheel motor sport. It uses small, open, four-wheeled vehicles called karts, go-karts, or gearbox/shifter karts depending on the design. 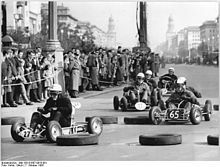 They are usually raced on scaled-down kart circuits. Karting is commonly seen as the stepping stone to the higher and more expensive ranks of motorsports. Karts vary widely in speed. Some known as Superkarts can reach speeds exceeding 160 miles per hour (260 km/h). Go-karts for the general public used for fun may be limited to speeds of 15 miles per hour (24 km/h). Art Ingels is generally accepted to be the father of karting. He was a long time hot rodder and a race car builder at Kurtis Kraft. He built the first kart in Southern California in 1956. The chassis are made of steel tube. There is no suspension. The chassis must flex enough to work as the suspension. Caged karts have a roll cage surrounding the driver. In Offset chassis the driver sits on the left side. Offset chassis are used for left-turn-only oval track racing. Braking is achieved by a disc brake mounted on the rear axle. Front disc brakes are becoming popular. Some classes do not allow them. Amusement park go-karts can be powered by 4-stroke engines or electric motors. Racing karts use small 2-stroke or 4-stroke engines. Karts do not have a differential. Both rear wheels turn at the same speed. Because of this, one rear tire must slide while cornering. Power is transmitted from the engine to the rear axle by way of a chain. Wheels and tires are much smaller than those used on a normal car. Like other motorsports, karts use different tires for the track conditions. Slicks are used for dry weather. Rain tires or "wets" are used for wet weather. Slicks with grooves cut into them are used for dirt tracks. Spiked tires are used for ice. Kart racing is generally accepted as the most economic form of motorsport available. As a fun pastime, it can be performed by almost anybody. As a motorsport, it is regulated by FIA (under the name of Commission Internationale de Karting (CIK). In the USA, many organizations regulate racing, such as the International Kart Federation (IKF), World Karting Association (WKA), Karters of America Racing Triad (KART), and Stars of Karting presented by the Indy Racing League. In the UK, the Motor Sports Association (MSA) regulate Karting. In Australia, kart racing is administered by the Australian Karting Association on the behalf of FIA and Confederation of Australian Motor Sport (CAMS). Kart racing is usually used as a low-cost and relatively safe way to introduce drivers to motor racing. Many people think it is for young drivers, but adults are also very active in karting. Karting is considered a first step in a racer's career. It can help develop quick reflexes, precision car control, and decision-making skills. Besides traditional kart racing, many commercial enterprises offer karts for rent, often called "recreational" or "concession" karts. The tracks can be indoor or outdoor. Karts are rented by sessions (10 to 15 minutes usually), they use sturdy chassis completed with bodywork for driver safety. Outdoor tracks can offer low speed karts strictly for amusement, or faster, more powerful karts similar to a racing kart. Typically, these outdoor tracks may also be used for traditional kart races. This page was last changed on 19 March 2019, at 17:39.